The Place Holder Concept is derived from the Part-Whole Concept . Quite frequently, questions involving the Place-Holder Concept can be easily solved if the place-holder appears on the right side of an addition or subtraction statement. However, if the place-holder were to appear on the left side of the equation, it would present a great challenge to some kids. When children first start learning the four operations of Math, they were taught that the "+" sign means "plus", "add" or "the sum of". Similarly, the "-" sign means "minus", "subtract" or "the difference between". If your kids are older or have mastered the concept of Algebra, they would most probably not have any problems with it. However, for younger kids, we can introduce a more concrete approach --- the Model Method. To illustrate this concept, consider the following questions. Step 1: Always start from the first number on the left side of the equation. Draw a box to represent 19. Step 2: Since the sign after 19 is "+", we are going to add a number to 19, thereby making it a number greater than 19. So, we put a dot at the top-right corner of the first box. This marks the starting point of the arrow we are about to draw next. Step 4: Since we are adding 7, we are actually making the number 19 (starting number) greater by 7. Hence, draw a second box directly below the arrow to show that the number 19 has been lengthened by 7. Step 5: Draw a last box to match the length of the first two boxes and write the unknown number (?) in this box. 19 + 7 = ? Thus, the answer is 26. Step 4: Since we are adding an unknown number, we are actually making the number 19 (starting number) greater by this unknown number. 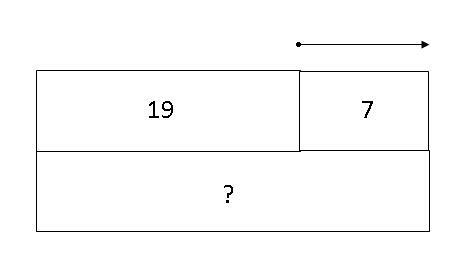 Hence, draw a second box directly below the arrow to show that the number 19 has been lengthened by the unknown number "?". Step 5: Draw a last box to match the length of the first two boxes and write the number 26 in this box. 26 - 19 = ? Thus, the answer is 7. Step 1: Always start from the first number on the left side of the equation. Draw a box to represent the unknown number "?". Step 2: Since the sign after the unknown number "?" is "+", we are going to add a number to "? ", thereby making it a number greater than "?". So, we put a dot at the top-right corner of the first box. This marks the starting point of the arrow we are about to draw next. Step 4: Since we are adding 7, we are actually making the unknown number "?" (starting number) greater by 7. Hence, draw a second box directly below the arrow to show that the unknown number "?" has been lengthened by 7. 26 - 7 = ? Thus, the answer is 19. Step 2: Since the sign after 19 is "-", we are going to subtract a number from 19, thereby making it a number smaller than 19. So, we put a dot at the top-right corner of the first box. This marks the starting point of the arrow we are about to draw next. Step 4: Since we subtracting 7, we are actually making the number 19 (starting number) smaller by 7. Hence, draw a second box directly below the arrow to show that the number 19 has been shortened by 7. Step 5: Draw a last box to represent the difference between the first two boxes and write the unknown number (?) in this box. Thus, the answer is 12. Step 4: Since we subtracting an unknown number "? ", we are actually making the number 19 (starting number) smaller by "?". Hence, draw a second box directly below the arrow to show that the number 19 has been shortened by "?". Step 5: Draw a last box to represent the difference between the first two boxes and write 12 in this box. 19 - 12 = ? Step 2: Since the sign after the unknown number "?" is "-", we are going to subtract a number from the unknown number "? ", thereby making it a number smaller than "?". So, we put a dot at the top-right corner of the first box. This marks the starting point of the arrow we are about to draw next. Step 4: Since we subtracting 7, we are actually making the unknown number "?" (starting number) smaller by 7. Hence, draw a second box directly below the arrow to show that the unknown number "?" has been shortened by 7.